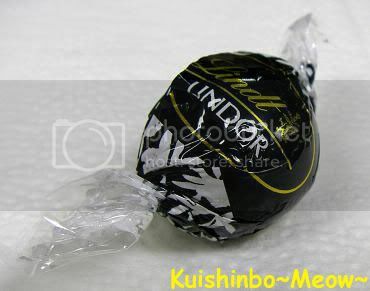 Before talking about these deliciously divine Lindor balls, I need to apologise to you all, dear, sweet, intelligent and discerning Chocoblog readers. Normally these articles are accompanied by close up photographs of the chocolate itself, unwrapped and sometimes half-eaten, to give you an idea of what it looks like. I have nothing but envy and respect for co-writers Dom and Simon who are able to do this when in the presence of some truly fine examples of what is capable of being produced in the wonderful world of chocolate. It was immediately after opening the lid that things got a bit out of control. I have no excuse other than to explain that these little black balls of beauty were far too irresistible to stop eating long enough to photograph. My husband, Love Chunks, will also be able to back up my claims because he helped me eat them! “Maybe we could get another box,” I answered hopefully. We both sat back on the couch, licked our choc-slicked fingers and relived the experience. At 60% cocoa content, these are without a doubt Lindt’s finest Lindor balls ever. Here in Australia they only seem to surface at Christmas time and we mostly have to content ourselves with the ‘dark blue’ variety (not sure what cocoa content, but a bit less than 60%) which can also be hard to hunt down if restricted to the local supermarket. This chocolate contains the perfect combination of bitterness to sweetness ratio in top quality dark and is also the rare kind of ‘real’ dark chocolate that also magically melts in your mouth instead of retaining the harder, grainier quality of most dark varieties. Well, it would melt in your mouth if you have the strength to resist chewing on it like a cocoa-starved crazy in order to reach for a second, third, fourth, fifth one…. From the moment it enters the mouth to the very last taste on your tongue, you are well aware that you are in the presence of some truly good chocolate. Dear Lovely Lindt Company Australia – Why so stingy with their availability? For the love of all that’s good and right with the world, make these godly globular delights available everywhere, all the time. Pretty please?? Filed under australia, dark chocolate, lindor, lindt. i imagine those in combination with hersheys kisses, like one ball then one kisses and so on, would be really good. We have a 60% Lindor Bar here as well. Same stuff, and very yummy it is too. i’m going to hunt them down. the lindt lindor 60% cocoa bar is irresistible. i think this will be great too. These are my absolute favorites! I was given a bag of them for my birthday. After eating two I made the mistake of leaving the bag in the living room. When I arrived home from work the next day, all that was left was the bag! Absolutely delicious!!! !